Since the fall of the Suharto dictatorship in 1998, Indonesia has had an impressive rise in world politics. As the largest economy in Southeast Asia and the fourth largest population in the world, with more than 248 million people in 2012, the country had often made its voice heard, particularly on issues connected with the former Third World, today known as the Global South. Of course, Indonesia has been a leading actor in the developing world since the 1955 conference of twenty-nine nations of Asia and Africa, the First Asia-Africa Conference held in the city of Bandung. But since 2001, Indonesia has consistently achieved GDP growth in excess of 5 percent, which “is forecast to dip slightly in 2014 before recovering next year,” according to the Asian Development Bank. In a regional context, as Abdul-Latif Halimi states, Indonesia’s rise will be “very significant, even if gradual.” Certainly, Indonesia’s growing presence will have implications for many countries nearby, including China, whose regional hegemony will surely be challenged. The Natuna Islands in the South China Sea are one possible flashpoint. Surrounded by a gas-rich seabed, the islands lie between China’s nine-dash line and Indonesia’s Exclusive Economic Zone, and could be a source of future tensions. 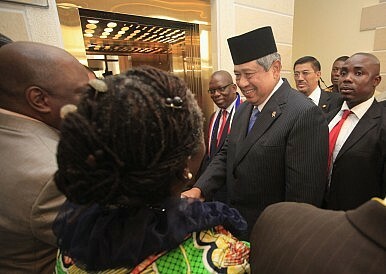 In an interregional context, the Indonesian government is seeking to bolster relations with Africa. It is worth looking at business interest in entering (or reentering, in some cases) African markets. An interview with the Indonesian Ambassador to Senegal, HE Andradjati, revealed that a number of Indonesian companies have approached the embassy in Dakar in the past two years. Many ventures took part in the annual International Trade Fair/Foire Internationale de Dakar (FIDAK). Another group of companies participated in the Trade Mission to Senegal and The Gambia organized by the Ministry of Trade of Indonesia in cooperation with the embassy. Yet another group visited Senegal, Sierra Leone and Guinea (Conakry) seeking to open up markets in these countries. “Although it is still below full potential there has been an increase in Indonesian private sector interest in doing business with Africa,” says Andradjati. Indonesia’s turn towards Africa is part of Jakarta’s assertive and pragmatic foreign policy, which since the early 2000s has been focusing on building a political and security community within the Association of Southeast Asian Nations (ASEAN) and also tightening links with the U.S., India, Australia, Russia, as well as other emerging countries. Indonesia is also a member of the G20. In fact, Indonesia’s rising global profile is also evident in the new numeronyms and acronyms created in the last couple of years: PricewaterhouseCoopers, for instance, coined “E7,” representing the world’s seven major emerging countries: China, India, Brazil, Mexico, Russia, Indonesia and Turkey. Goldman Sachs speaks of the “N-11” (Next Eleven), referring to Bangladesh, Egypt, Indonesia, Iran, Mexico, Nigeria, Pakistan, the Philippines, Turkey, South Korea and Vietnam, as the emerging countries with the potential to join the club of the largest economies over the course of the 21st century. This N-11 can be compared to CIVETS, coined by the Economist Intelligence Unit, which lists Colombia, Indonesia, Vietnam, Egypt, Turkey and South Africa on the same grounds. All include Indonesia, a nod to its size and potential. As Karen Brooks points out in her excellent 2011 article in Foreign Affairs: “the real driver of the country’s recent economic growth has been the Indonesian consumer, with consumption accounting for roughly 60 percent of GDP.” It is not surprising, then, that the private sector concentrates on the country’s internal market and on expanding in Asia. Africa still seems rather distant these Indonesia’s entrepreneurs. The government, however, wants market diversification, and is targeting several African countries with “non-oil-and-gas products,” according to the Jakarta Post. According to Andradjati, Indonesian businesses are competitive in Africa, able to compete with other Asian actors. “One of the strengths of Indonesian players is the quality of their products,” which include palm oil and associated products, textiles, footwear, cars and automotive components, and electronics. According to Statistics Indonesia (BPS), major African trading partners for Indonesia in 2011 were South Africa, Nigeria, Egypt, Algeria and Tanzania, while trade with Madagascar, Kenya, Benin, Angola and Ghana was growing. In bilateral trade, the win-win strategy for Indonesia and ECOWAS countries is to create direct trade relationships. It will also be essential to oversee the financial export guarantee schemes and incentives, as well, according to Professor Georges Suha, former Gambian ambassador to UNIDO and currently dean of the Hong Kong-based Alfred Nobel Open Business School. Suha emphasized in an interview that, “Indonesia recognizes Senegal’s potential as its entrance to West African markets. The biggest trophy of this penetration is the Senegalese intention of buying two CN-235-220 planes from state aircraft manufacturer PT Dirgantara Indonesia.” Also worth noting, in 2012 West Africa attracted the largest FDI volumes of any African region, estimated at USD15.1 billion, driven mostly by demand for resources, as reported by the African Economic Outlook 2013. Indonesia’s legislative elections in April resulted in a win for the main opposition party (Indonesian Democratic Party of Struggle – PDI-P), as expected. Notes Oliver Oehms, senior economic advisor on trade and investment at the Indonesian Chamber of Commerce: “The elections [and later on the presidential election in July 2014] will not harm businesses but can help to change the perspective of Indonesia. The country does not fully use its export potential and the trade pattern that has been characterizing Indonesia for five years has not really changed.” Greater political commitment could contribute to more trade beyond Asia, too. Stronger cooperation with Africa would give Indonesia a greater role, not only on the African continent but in the rapidly changing context of Afro-Asian relations. Seeking ways to boost trade, assisting African countries in different forms along the lines of the “Bandung solidarity,” and pursuing a pragmatic foreign policy under a new president could all result in an even more powerful and assertive Indonesia, one that may even warrant inclusion in the BRICS, perhaps as a replacement for Russia in a new BIICS group. As economist Nouriel Roubini argued, “from an American perspective, Indonesia is an attractive alternative to Russia.” In any case, the addition of Indonesia would obviously redefine the BRICS, but it would also bolster its claim to be the most important interregional grouping in the Global South. Istvan Tarrosy is co-editor of The African State in a Changing Global Context. Breakdowns and Transformations (Berlin, 2010), and is Assistant Professor of Political Science at the University of Pecs, Hungary. He was Fulbright Visiting Research Fellow at the Center for African Studies, University of Florida in 2013, early 2014. As it tallies votes from Wednesday’s election, Indonesia’s economic outlook is strong. What does that mean for the region?